In a never-ending quest for enjoyment of life, many Americans, including Floridians, are turning to trampoline parks for entertainment. These parks have seen a recent increase in popularity are turning what used to be primarily a backyard activity into an amusement park-like outing. Unfortunately, trampolining does carry with it a significant risk of injury. Accordingly, with this increase in popularity, this risk is now assumed by a greater amount of people. Nevertheless, when there is an injury, the possibility that someone or some entity may be responsible, or liable, for the injury exists, and retaining the services of an attorney experienced in personal injury matters can help obtain just compensation. Recently, an NBC affiliate in Miami reported on this increase in injury from these increasingly-popular trampoline parks. A discussion of two legal theories on which responsibility for trampoline-related injuries may rest, the types of injuries that can occur from trampoline use, and the effect of waivers, will follow below. 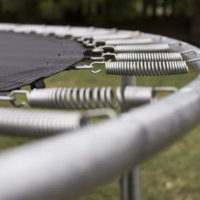 When an individual is injured while playing on a trampoline, there are typically two legal theories of liability which may provide financial compensation for the individual’s injuries. Initially, an injured individual may be able to file a negligence claim against the trampoline owner. Negligence is the failure, in this case of the trampoline owner, to exercise reasonable care, resulting in harm to an individual. Generally speaking, reasonable care is defined as how a prudent person would act under the same or similar circumstances. If in the case of a trampoline park, to ensure that all park rules are enforced. If the injury was caused by faulty manufacturing or design of the trampoline itself, the individual may be able to file a product liability claim, which is essentially a form of negligence, but directed at the manufacture or design of the trampoline. These types of claims are designed to hold a manufacturer or seller liable for placing a defective product into the stream of commerce and ultimately into the hands of a consumer. Trampoline manufacturers can be held liable for any defects in the design or manufacture of their product, or for failing to provide adequate warnings or instructions. As in any liability case, facts, including eyewitness testimony, site accident inspections and surveillance videos, are important in determining the cause of the accident. Falling on the trampoline’s springs or frame. In addition, many trampoline parks ask users to sign waivers before granting them permission to use the trampoline. These waivers typically contain language that says the customer releases the trampoline park from all liability, will not sue and will hold the trampoline park harmless for any and all damages should an injury occur. It should be understood that the effect of a waiver on a potential personal injury case depends on a number of factors including the language of the waiver, who signed it, whether a minor was involved, and whether the language was clear and unambiguous. An experienced attorney can help navigate through the language to determine its applicability. If you, or a loved one, suffered an injury resulting from a trampoline, contact the attorneys at Pita Weber Del Prado as soon as possible. We have experience in dealing with these types of injuries, and will use our skill to determine whether the fault lies with the property owner or the designer of the trampoline, and work with you to get you the compensation you deserve. Contact our Miami office today for an initial consultation.